Aug 31 to Oct 1st. Thu-Sat 8pm. In a bleak pocket of the urban midwest, a 13 year old falls in love with a bug. Tangled in adolescent passion, the t(w)een stumbles treacherously along the journey to independence, the hunt for intimacy, and the struggle to make sense of the mess that comes with change. Recommended for Mature Audiences. From Rough House Theatre - In a bleak pocket of the urban Midwest, two 13 year olds fall deeply in love. One is a girl, the other a bug. Tangled in adolescent passion, the human teen stumbles treacherously along the journey to independence, the hunt for intimacy, and the struggle to make sense of the mess that comes with change. 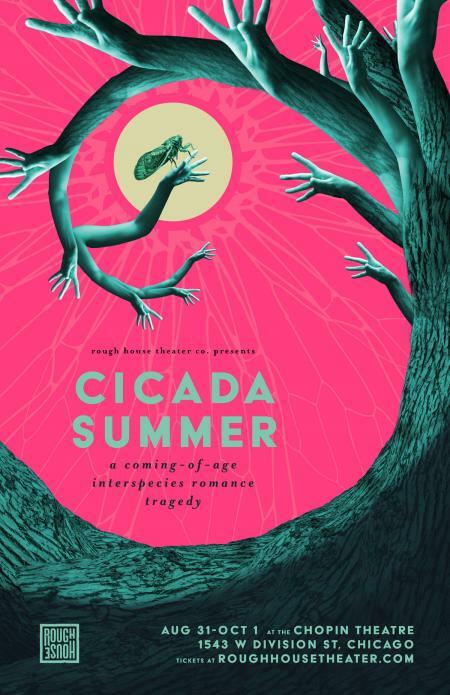 Penned by Claire Saxe, directed by Michael Brown and set in a puppet world created by designer Emily Breyer and Mike Oleon, Cicada Summer is a rich physical and visual exploration of the agony and ecstasy of metamorphosis - human and otherwise.